Romeries is a village approximately 16 kilometres south of Valenciennes and 4 kilometres north-east of Solemes. The Communal Cemetery is on the west side of the village on the north side of the road to Solemes. Wheelchair access to this site is possible, but may be by alternative entrance. Part of the II Corps retired through this area during the Retreat from Mons in August 1914, and in October 1918, Commonwealth forces returned during the Advance to Victory. Briastre was captured on 10 October 1918, Belle Vue Farm on 20 October, Romeries itself and Beaudignies on 23 October and Englefontaine on 26 October. The Battle of the Sambre, the last great action of the war, carried the front forward into Belgium and ended with the Armistice. Romeries Communal Cemetery Extension is one of the burial grounds of those who died between these dates. BRIASTRE-SOLESMES ROAD MILITARY CEMETERY, BRIASTRE (Nord), was used by the 37th Division and the 1st Wellington Regiment (New Zealand) from the 11th to the 16th October, 1918. It contained the graves of 25 soldiers from the United Kingdom (12 of the 4th Middlesex) and 11 from New Zealand. It was about 800 metres South-East of Briastre, across the Selle. BRIASTRE CHURCHYARD contained the grave of one New Zealand soldier. BELLE VUE FARM CEMETERY, BRIASTRE, was 200 metres South of the Farm, which was almost immediately East of Briastre, across the Selle. It contained the graves of 16 soldiers of the 4th Middlesex who fell on the 10th October. BEAUDIGNIES CHURCHYARD (Nord) contained the graves of five New Zealand soldiers who fell on the 4th November. ENGLEFONTAINE GERMAN CEMETERY contained the graves of three soldiers from the United Kingdom who fell on the 26th and 27th October. GRAND GAY FARM CEMETERY, LOUVIGNIES-QUESNOY (Nord), was nearly 1.6 kilometres South of Louvignies. There were buried in it 37 soldiers from the United Kingdom, 24 of whom belonged to the 9th Duke of Wellington's. SALESCHES CHURCHYARD (Nord) contained the graves of three soldiers from the United Kingdom who fell on the 25th and 29th October. ST. PYTHON COMMUNAL CEMETERY EXTENSION was made by the 2nd Division. It contained the graves of 23 soldiers from the United Kingdom, two from New Zealand, and one from Canada, who fell between the 27th October and the 8th November. There are now 832 burials and commemorations of the First World War in the extension. 129 of the burials are unidentified but there are special memorials to 15 casualties believed to be buried among them. Casualty Details: UK 719, Canada 1, New Zealand 112, Total Burials: 832. G/46730 Private Ernest Jackson, 24th Bn. Royal Fusiliers, executed for desertion, 7th November 1918, aged 32. Plot IV. C. 20. 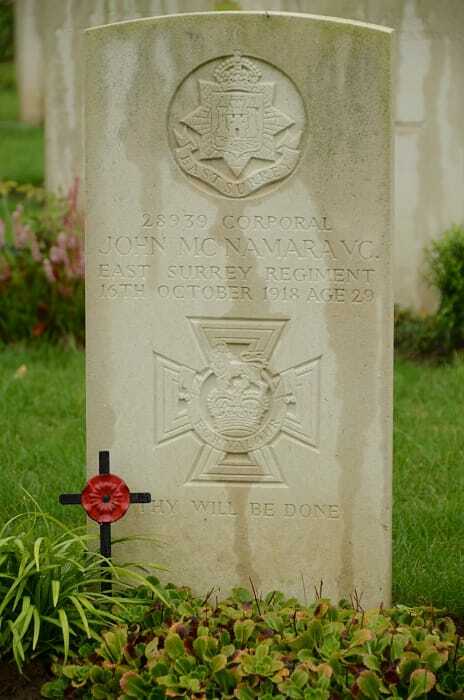 28939 Corporal John McNamara, V. C.
9th Bn. East Surrey Regiment, died 16th October 1918, aged 29. Plot IV. D. 17. Son of John and Margaret McNamara; husband of Mary Ann Mitchell (formerly McNamara), of 82, Stone Row, School Lane, Preston. Citation: An extract from the London Gazette, dated 12th Nov., 1918, records the following:-"For conspicuous bravery, initiative, and devotion to duty. When operating a telephone in evacuated enemy trenches occupied by his battalion, Cpl. McNamara realised that a determined enemy counter-attack was gaining ground. Rushing to join the nearest post, he made the most effective use of a revolver taken from a wounded officer. Then seizing a Lewis gun he continued to fire it till it jammed. By this time he was alone in the post. Having destroyed his telephone, he joined the nearest post, and again displayed great courage and initiative in maintaining Lewis gun fire until reinforcements arrived. It was undoubtedly due to the magnificent courage and determination of Pte. McNamara that the other posts were enabled to hold on, and his fine example of devotion is worthy of the highest praise." 22nd October 1918, aged 19. Killed in action 4th November 1918, aged 28. 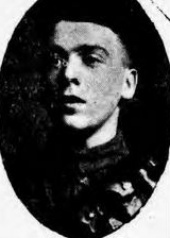 Son of Emily Keighley (formerly MacLachlan), of Alston Hall Villa, Grimsargh, Preston, England, and the late John MacLachlan.